Previous experiments with growing trees, involved drawing shapes directly to the screen, this meant starting with a thick trunk and gradually shrinking down the bush size the longer the branch ran for. 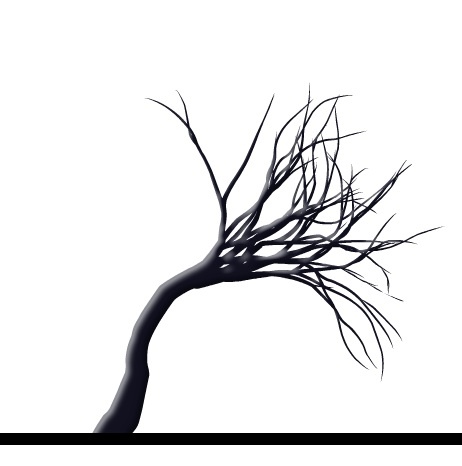 This time I was determent to grow a tree through bezier points, this could allow for the tree starting as a thin vine and gradually getting thicker as it went, it would also mean at the end of the growth, each point in the tree would be a know so the tree could then been animated, later with full control. Initial test worked well, with branches growing smoothly with reasonable performance, The was some issues with the Bezier curves overlapping them selves, (creating holes in the branches) but I found a custom set of path classes, the greatly reduced this. A large tree required a lot of processing to grow, and slowed the computer to a crawl. Also the length of each branch grew simultaneously giving the tree an expanding feel rather than a sense of growing. To aver come both these issues, I delayed the branches growing, this meant there were less branches growing at the same time (Good for processor), but more importantly it gave a more natural feel to the growth. I was fairly pleased with the final Bezier trees, there was plenty of room for growing different looking trees by tweaking parameters, And I now had the ability to grow a practically infinite number of different trees. This is what I love about computer graphics, I couldn’t draw a tree this interesting but I can grow one.